In lieu of flowers memorial donations may be made in memory of Bryan Brown and left at the funeral home. 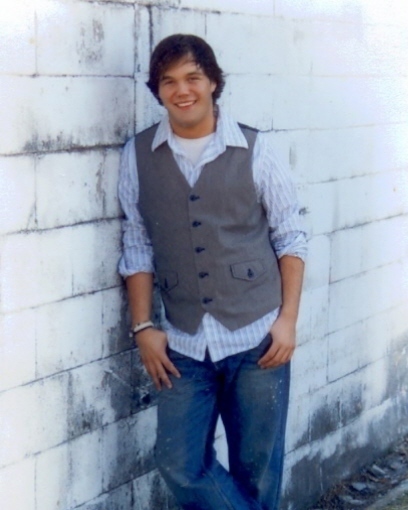 Bryan Dean Brown, age 20, of El Dorado Springs, Missouri, our loving son, grandson, brother, cousin, student, and friend, passed away on June 29, 2011, in his home in El Dorado Springs. He was born on June 1, 1991, to Dean Kirbey Brown and Leigh Ann (Steward) Brown. Bryan graduated from El Dorado Springs High School in 2009 and had attended Missouri Southern State University (MSSU) in Joplin, MO. Bryan was preceded in death by his father, Dean Kirby Brown; his grandparents: Marian Brown, Johnnie E. (Jay) Brown, and Sandra Lorene Steward; his aunt Darla Jean Steward; and his uncle Johnnie Brown. He is survived by his mother, Leigh Ann (Steward) Morgan; his brothers: Chase Brown and Gaven Morgan; his sisters: Lakin Madison Lindsey and Maddy Rowland; his grandparents, Leon and Debee Steward; his great-grandparents: Josephine Johnson and Joe and Nancy Levi; his aunts and uncles: Mike Steward, Brad and Melanie Steward, Scott and Stephanie Steward, Mike and Kim Brown, Bobby Brown, Karen Brown, Tim and Judy Norman, and Mark and Teresa Fear; as well as being survived by numerous cousins, friends, and extended family. Bryan’s interests revolved around art, music, fashion, family, friends, and he had aspirations to pursue art in education. His proudest moment was graduating high school, and he was very proud of the fact that he would be one of the first in the Brown family to go to college. Bryan is remembered for his loyalty to family, his gift in creating art, his friendship, being very outgoing, and his ability to make those around him feel good with his warm, positive, and caring personality. Bryan was always seen as a forgiving and devoted person, as he always put the needs of others before his own. Chase, Lakin, and Gaven looked up to Bryan not only as a brother, but also as a father figure at times, since he was the oldest. There are those in his life that described him as “The Rock” for others to lean on. He influenced many with his kindness and selflessness. Bryan was a genuine soul. Bryan’s legacy comes from his own words of wisdom, “that no matter what, you should always be your own person.” He will be missed by many but forgotten by none. The family received friends at Bland-Hackleman Funeral Home on Friday, July 1, 2011, from 6-7 p.m. Funeral services were held on Saturday, July 2, 2011, at 1:00 p.m. at the El Dorado Springs First Baptist Church. Rev. Brent Bland officiated and Tiffany Edwards provided music. Interment followed in Harwood Cemetery under the direction of Bland-Hackleman Funeral Home. Pallbearers were Brad Steward, Scott Steward, Mike Steward, Bobby Brown, Mike Brown and Josh Brown.